Ignoring that no such absolute statement is true (e.g., “all politicians are criminals”), it is a good slogan to ponder. What is the efficacy of armed response to an attacker? We at the Gun Facts project have covered this question quite a bit on the Guns and Crime Prevention page, and there is no use going through all that again. But in terms of mass public shootings (MPSs), and we’ll include active shooter events (ASEs) in this tally as well, the situation has better clarity due to the fact there is an indisputable violent event happening. Many defensive gun uses (DGUs) may be against unarmed attackers or have a lower urgency of response. With MSPs and ASEs, the need to intervene to prevent loss of life is clear and indisputable. Armed interventions are the single largest form of event resolution. Armed intervention greatly reduces casualties. At schools, armed resources officers greatly reduce carnage (if they intervene). Adding concealed carry permit (CCW) holders to schools marginally improves outcomes over armed resource officers. One of the more interesting studies of ASEs 1 examined how such events were stopped. 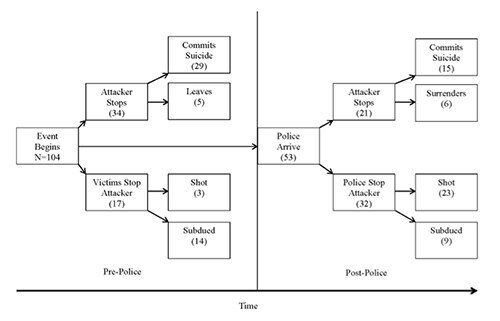 The authors split their analysis into what happens before the police arrive and after. We’ll discuss this divide a bit more below as it fits into the ongoing debate about allowing teachers in K12 schools to be armed. There are several unsurprising outcomes from their analysis. 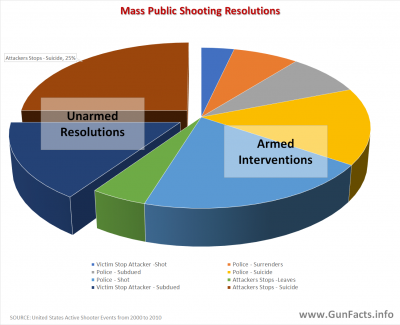 Armed intervention makes up a minimum of 55% of the event resolutions. Armed interventions make up 73% of the resolutions if you omit the instances where the attacker committed suicide before the police arrived. 40% of all events end with the attacker committing suicide, and this goes up to 61% if you assume “death by cop” was the attacker’s intended end game. Only 20% of the instances end with the attacker walking away or being subdued by people without guns. 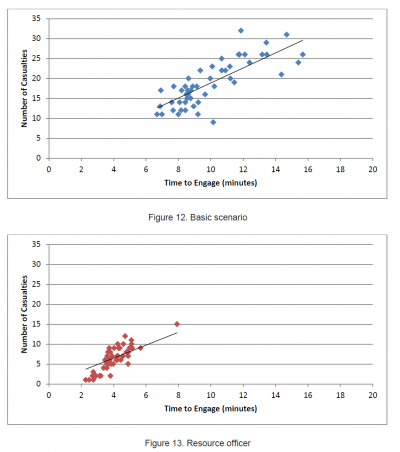 Another study 2 looked specifically at school shootings, and using the available empirical data, modeled a few things including the amount of time different defenders (cops, resource officers, people with concealed carry permits) would take to intervene and how many/few people would get hurt by the attacker. I find little wrong with their modeling, aside from the relative dearth of school shootings available at the time with which to form their data set. 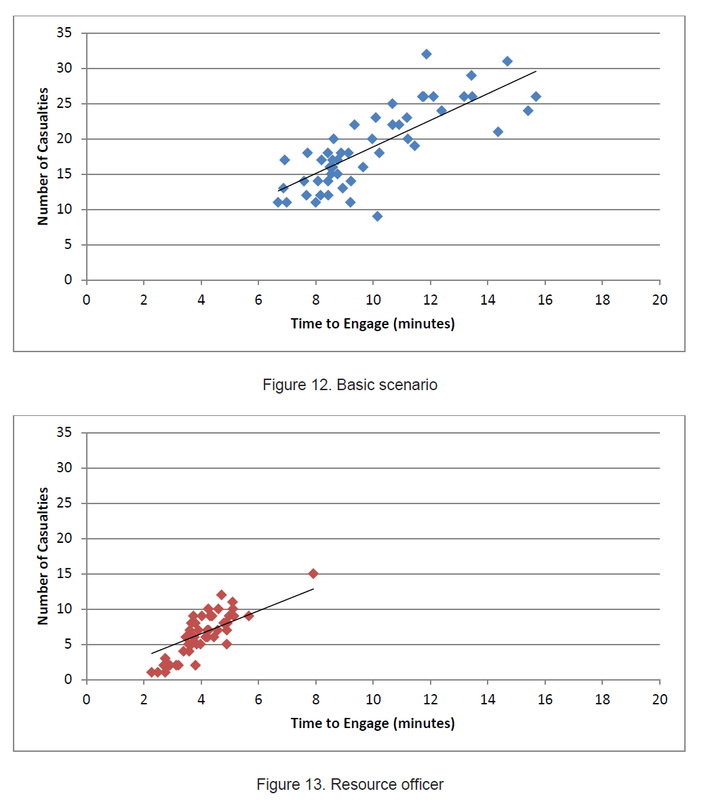 Accepting that there may be some statistical noise due to limited instances of mass public shootings at schools, the authors determined that when an armed resource officer was on campus and engaging the attacker (unlike at Parkland), the response time was significantly shorter (less than half the time) and the number of casualties was significantly lower (about 40% lower). But the authors went further. They added to the mix scenarios where a citizen with a concealed carry permit was on site, such as a teacher with a CCW and a gun. The numbers are compelling, and are in the same ranges as what we saw in the previous study when we compare the rate of armed resolutions with unarmed ones (78% vs 22% respectively). 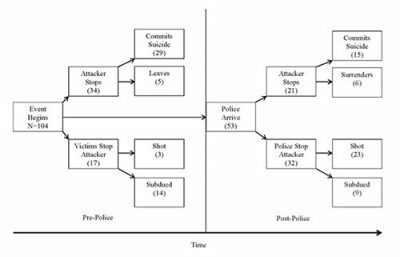 The empirical data shows that armed resistance to ASEs and MPSs provides the best outcome, not only in terms of the rate of halting such events, but also in reducing the number of people wounded or killed by the attacker. The question is who should be armed, especially at schools. If schools have more resource officers, more armed faculty, or in the case of colleges, more CCW carrying students, then the death and injury rate is substantially reduced. 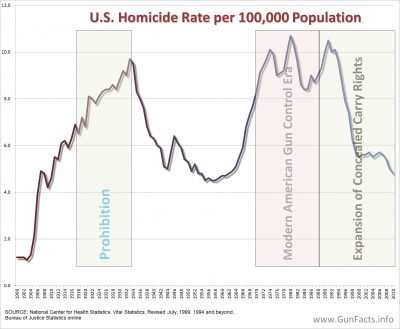 Common sense would make the case you present with data, unfortunately anti gun people have no common sense and don’t want to let facts get in the way of their mania for eliminating guns. They will march today, have more restrictive laws put in place which will not have any effect then they will come back for more restrictive laws….lather, rinse, repeat… until all guns will become illegal and the murders will be carried out with knives, IEDs and poison agents. Too bad they can’t see that. It’s apparent that armed LEO’s in schools haven’t made a spit of difference in the number of children and adults killed in shootings. If the bad guy knows that there are armed, well trained persons in and on the school grounds with the sole purpose of protecting the children, and he doesn’t know how many there are ……. probably will think twice about that school.. ! Biggest problem is that the Law Enforcement Community has scared the schools into thinking that only trained LEO’S can carry a gun as skillfully as they can. cow plop !! thousands of military trained persons would gladly carry in a school to protect it. They don’t need six months of cop school to learn how to stop a shooter. They’ll all do it voluntarily as well, saving the schools gazillions of $. But until we can convince the schools. nothing will change and we will have more coward cops afraid to stop the killing of our children. I’d mention armed citizens such as parents, as an additional resource rather than limit it to teachers (and janitors, etc.). Who better to protect children than a parent? Also, by only mentioning permittees, you exclude open carriers (which I’m sure schools would never allow). I volunteered to start an armed parent security team when my school’s Superintendent posted a statement to Facebook outlining their security procedures. Never got a response. I wish the statement “Adding concealed carry permit (CCW) holders to schools marginally improves outcomes over armed resource officers.” had been explored a bit more. I have little doubt that in schools where there are armed resource officers that is true. What data is there to evaluate if concealed carry permit (CCW) holders in schools without armed resource officers are more that a marginal improvement over no armed personnel. We have counties where there is little coverage of the lower grades grades by armed resource officers or assigned LEOs. One county has announced that they can no longer provide armed resource officers to any schools.